How to remove the parts that are not fun ? How to add even more fun ? She defined what she called the funtinuum, which is that fun is a function of engagement and interaction. Basically, you won’t have fun if you are doing nothing, or if no one cares about your work. That aligns well with Daniel Pink’s drivers of motivation : Autonomy, Mastery and Purpose. This talk might not be of interest for all, but it is for us at work. 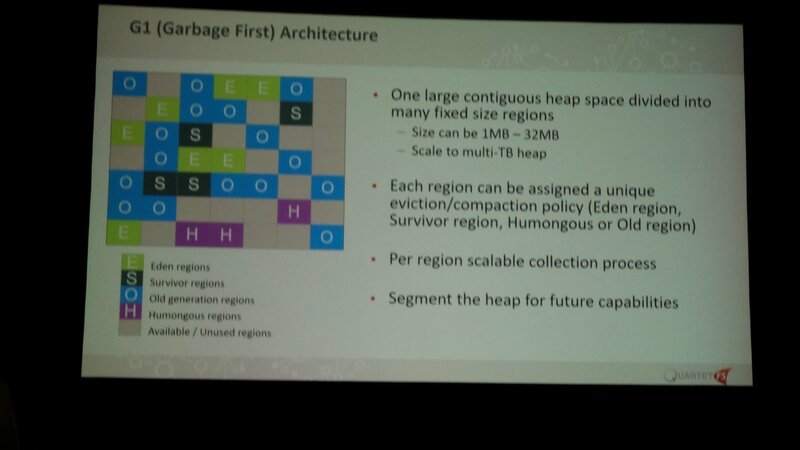 It went through the improvement to come to Java 9’s G1 garbage collector. To summarize, to scale to very large heaps, it will split the memory into regions. Objects should be allocated on different regions depending on their specificities, which might help to build NUMA aware applications. Having the heap split up in smaller chunks enables the GC to run in parallel, which can speed up the old generation GC by up to 50 times ! I haven’t been touching Clojure for a while but I gave the language a try a few years ago. I had heard about Clojure spec but hadn’t taken the time to look at it in details. As I understood it all, Spec is like some sort of Design by Contract on steroïds ! Clojure is not statically typed, but you can now assign spec metadata to values. A spec is roughly a predicate. By defining specs for the inputs and outputs of functions, it is possible to verify at runtime that the function is behaving correctly. As did Bertrand Meyer in the classic OOSC2, who advised to use contracts during development only, Stuart explained that we should care about developer vs production time instead of compile vs runtime. From this point of view, it is not of great importance whether the compiler or the continuously running test suite finds an issue. 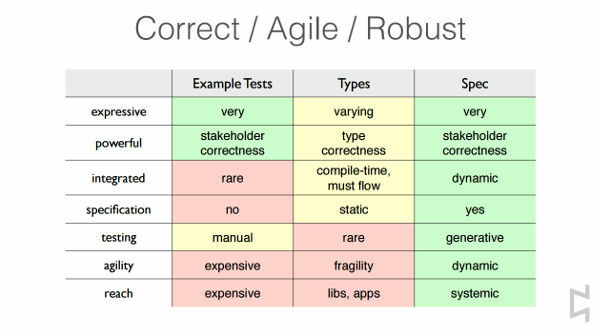 Although I don’t believe that generative testing can ever replace example based testing altogether, it certainly can help. All in all, the presentation was insanely great and engaging. It made me seriously think of going into Clojure programming again ! Development Horror Stories was a lot of fun, especially the winning story ! I summarized 3 others JavaOne talks here.